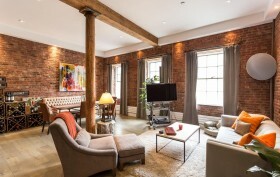 This South Street Seaport loft, at 272 Water Street, certainly hasn’t abandoned its history. It still retains details of the former warehouse building and boasts an undeniably lofty interior. But it’s also been decked out with plenty of high-end finishes, like new plank floors and a custom wood and steel staircase leading to a lofted bedroom. The owner and renovator (per Curbed) is the Director of Team Operations for the New York Yankees, who travels so often he only enjoys the space about half the year. Likely why he’s just listed the home for $1.595.